So last night we had our first guests over. Much to Kaiser's delight it was his favorite person John and his wife Ruth. Hooray! However there was a twist. John and Ruth now have a son. Theo! 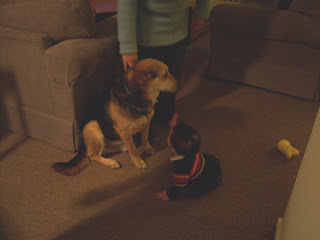 And Theo was intrigued with Kaiser. I'm not so sure that the feeling was entirely mutual. 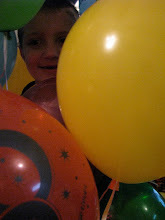 The hubby got down on the floor to help facilitate the introduction and everything seemed to go well. Theo followed Kaiser everywhere. That child has some get up and go! He really enjoyed crawling around the house and trying to catch up with the dog. Kaiser was extremely patient and I was very proud of him. 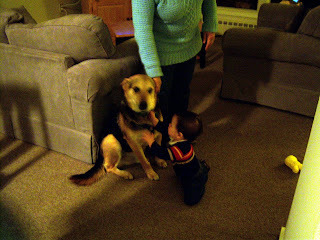 Kaiser even did well when Theo tried to pull himself up using the dog as leverage. Our cat however, made himself scarce. Kaiser got canned dog food for being such a well behaved boy. He deserved it for such exemplary behavior.